25.01.2019 "Notice No. 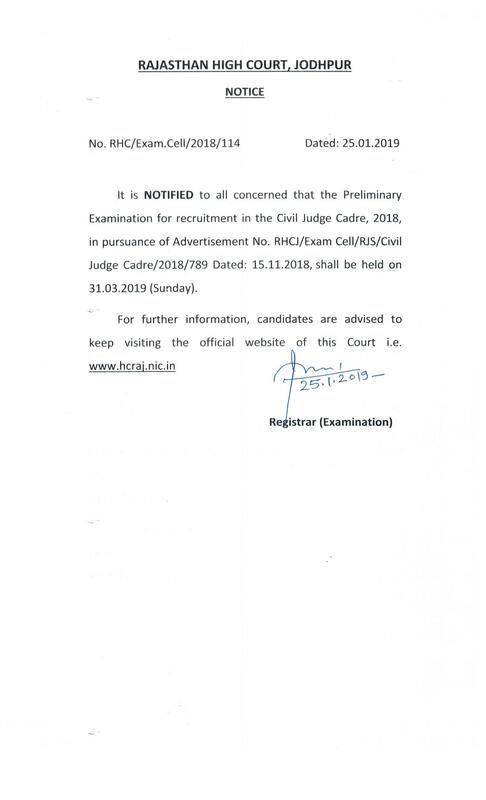 RHC/Exam.cell/2018/114 Dated:25.01.2019 (Declaration of date for holding Preliminary Examination for Recruitment in the Civil Judge Cadre,2018)"
02.01.2019 "Corrigendum (Amended Advertisement) No. RHC/Exam.Cell/RJS/CJC/2019/04 Date 02-01-2019 in the Civil Judge Cadre, 2018"
15.11.2018 ADVERTISEMENT No. : RHCJ/Exam Cell/RJS/Civil Judge Cadre/2018/789 Dated : 15.11.2018 in the Civil Judge Cadre, 2018.